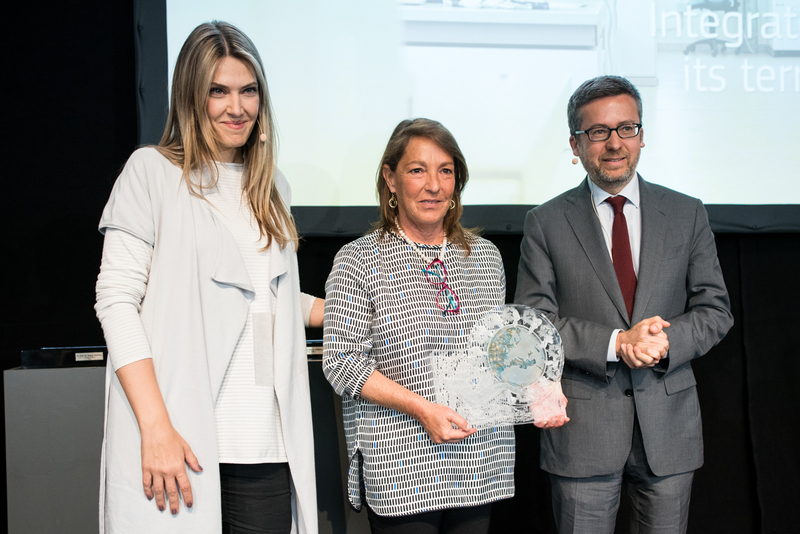 <h2>Plant-based molecules company wins EU’s women innovators prize</h2><br /><p>Dr Colucci, whose businesses have filed 14 patents for newly discovered molecules, said that she was not someone who knew what she wanted to do from a young age.</p> <p>‘I visualised my dream when I was 45 years old,’ she said during her acceptance speech. ‘I realised that my dream was doing something that could make a difference in my home town.’</p> <p>At that time she was working as a scientist in the US, but returned to Naples, Italy, to set up her first company, Arterra Bioscience. Like its daughter company Vitalab, Arterra uses specialised technology to understand how plant cells send signals to each other, which allows scientists to identify particular molecules that might be useful for industry.</p> <p>To date, Dr Colucci’s work has uncovered 35 plant-derived active ingredients for use in the agrochemical and cosmetics industries.</p> <p>Both of her companies have a large proportion of young female scientists on the staff, she said, adding that this was partly because biology is a particularly attractive field for women.</p> <p><strong>Engaged</strong></p> <p>Carlos Moedas, the EU’s commissioner for research, science and innovation, who was presenting the awards with member of the European Parliament Eva Kaili, said that young women are very engaged in science. He pointed out that they win up to 43% of the EU’s Marie Skłodowska-Curie Actions grants to promote the mobility of researchers.</p> <p>But, he noted that as women advance in their careers, their progress often becomes blocked in subtle ways.</p> <p>‘Young women are extremely present in science. But as you go up the ladder, the invisible barriers come,’ he said. Solutions need to be found to tackle this, he said.</p> <p>MEP Kaili, who is a leading authority in the European Parliament on blockchain and cybersecurity, said that her gender affected how she was treated when she attended certain conferences.</p> <p>‘The first time I went to an event on blockchain, they all thought that I was there working for the catering, or that maybe I was supporting somebody. There’s still a strong perception that women cannot be in some places, which is insane,’ she said.</p> <p>‘We have to make sure that each company that gets EU funding has women on the board,’ she added when asked what could be done to rectify the situation.</p> <p>According to the EU, women make up just <a href="https://ec.europa.eu/growth/smes/promoting-entrepreneurship/we-work-for/women_en" target="_blank" rel="noopener noreferrer">34.4% of self-employed people</a> in the EU, and only 30% of start-up entrepreneurs.</p> <p>The goal of the EU’s Prize for Women Innovators is to recognise female entrepreneurs that have used scientific innovation to create a successful business.</p> <p> <div class="quote-view quotesBlock quote_horizontal"> <div class="quotesTop"><img src="https://horizon-magazine.eu/sites/all/themes/horizon/images/quotes_top.png" alt="" title="" /></div> <p>'There’s still a strong perception that women cannot be in some places, which is insane. '</p> <blockquote><p>MEP Eva Kaili, European Parliament </p></blockquote> <div class="quotesBottom"><img src="https://horizon-magazine.eu/sites/all/themes/horizon/images/quotes_bottom.png" alt="" title="" /></div> </div> </p> <p>The second prize of €50,000 went to Alicia Asín Pérez, CEO and founder of Libelium, a Spanish company that facilitates the collection and sharing of data via the Internet of Things.</p> <p>Libelium provides customers with sensors that are specific to their goals and connects those sensors to the cloud. The service has been used to evaluate the health of parks and green spaces in Spain, to track racing ships during competitions in Germany and to monitor rivers in Colombia to prevent floods.</p> <p>‘We have to put gender equality on the frontline,’ said Pérez while accepting her award. ‘Take care of our young girls. Never allow anyone to call them bossy when they are showing their leadership skills.’</p> <p><strong>Easily understandable</strong></p> <p>The third prizewinner, taking home €30,000, was Walburga Fröhlich, an Austrian entrepreneur whose business makes it easier for people with disabilities to enter the workforce and engage in public life. Her company, atempo, translates complex government texts into formats that are easily understandable for people with learning difficulties and disabilities.</p> <p>‘If you cannot understand what’s going on around you, and if you do not know your rights, then the truth is that you are not able to participate easily in society,’ she said.</p> <p>The prize for the best female innovator under 30, the so-called Rising Innovator award, went to Karen Dolva who co-founded a company called No Isolation. The Norway-based business works on improving communication between socially isolated people and the outside world.</p> <p>Their first product was a robot that enables children with severe long-term illnesses to interact with their friends and attend school while bed-bound. The robot takes the physical place of the child in the classroom and the sick child can then communicate with friends and teachers via the machine.</p> <p>‘We want to fight loneliness and social isolation,’ said Dolva. ‘We started off with kids with long-term illness and built a telepresence robot for them. Now we’ve moved on to building computers for the very old.’&nbsp;</p> <p> <div class="moreInfoBlock"> <h3>The Issue</h3> <p>According to the EU's 2015 <a href="https://publications.europa.eu/en/publication-detail/-/publication/f546dfed-41a9-11e6-af30-01aa75ed71a1" target="_blank" rel="noopener noreferrer">She Figures report</a> into gender equality in research and innovation, women made up 47% of PhD graduates in the EU, but accounted for only a third of researchers and one-fifth of top-level researchers. Only one in five heads of institutions were female.</p> <p>The EU is addressing this in a number of ways. This is the fifth year of the EU Prize for Women Innovators, which is open to women living anywhere across the EU who have founded a successful company, brought innovation to market, and who have benefited from research and innovation funding from public and private sector. It is the second year that the Rising Innovators category has been included.</p> <p>The EU is also&nbsp;<a href="http://ec.europa.eu/research/swafs/index.cfm?pg=policy&amp;lib=gender" target="_blank" rel="noopener noreferrer">working to achieve gender equality in research and innovation</a>&nbsp;through its research funding programme Horizon 2020, and through the European Research Area to break down barriers to research. The aim is to achieve gender equality in scientific careers and decision making, and to integrate the gender dimensino into the content of research and innovation.</p> </div> </p> <p><em>If you liked this article, please consider sharing it on social media.</em></p> <p><a href="http://bit.ly/newsalertsignup" target="_blank" rel="noopener noreferrer"><img src="https://horizon-magazine.eu/sites/default/files/news-alert-final.jpg" alt="" width="983" height="222" /></a></p> <br /> <img src=”http://www.google-analytics.com/collect?v=1&tid=UA-40077089-1&cid=plant-based-molecules-company-wins-eu’s-women-innovators-prize&t=event&ec=republish&ea=read&el=plant-based-molecules-company-wins-eu’s-women-innovators-prize&cs=republish&cm=republish&cn=republish&cm1=1" /> This post <a href="https://horizon-magazine.eu/article/plant-based-molecules-company-wins-eu-s-women-innovators-prize.html">Plant-based molecules company wins EU’s women innovators prize</a> was originally published on <a href="https://horizon-magazine.eu/">Horizon: the EU Research &amp; Innovation magazine | European Commission</a>. Dr Colucci, whose businesses have filed 14 patents for newly discovered molecules, said that she was not someone who knew what she wanted to do from a young age. At that time she was working as a scientist in the US, but returned to Naples, Italy, to set up her first company, Arterra Bioscience. Like its daughter company Vitalab, Arterra uses specialised technology to understand how plant cells send signals to each other, which allows scientists to identify particular molecules that might be useful for industry. To date, Dr Colucci’s work has uncovered 35 plant-derived active ingredients for use in the agrochemical and cosmetics industries. Both of her companies have a large proportion of young female scientists on the staff, she said, adding that this was partly because biology is a particularly attractive field for women. Carlos Moedas, the EU’s commissioner for research, science and innovation, who was presenting the awards with member of the European Parliament Eva Kaili, said that young women are very engaged in science. He pointed out that they win up to 43% of the EU’s Marie Skłodowska-Curie Actions grants to promote the mobility of researchers. But, he noted that as women advance in their careers, their progress often becomes blocked in subtle ways. ‘Young women are extremely present in science. But as you go up the ladder, the invisible barriers come,’ he said. Solutions need to be found to tackle this, he said. MEP Kaili, who is a leading authority in the European Parliament on blockchain and cybersecurity, said that her gender affected how she was treated when she attended certain conferences. ‘The first time I went to an event on blockchain, they all thought that I was there working for the catering, or that maybe I was supporting somebody. There’s still a strong perception that women cannot be in some places, which is insane,’ she said. ‘We have to make sure that each company that gets EU funding has women on the board,’ she added when asked what could be done to rectify the situation. According to the EU, women make up just 34.4% of self-employed people in the EU, and only 30% of start-up entrepreneurs. The goal of the EU’s Prize for Women Innovators is to recognise female entrepreneurs that have used scientific innovation to create a successful business. The second prize of €50,000 went to Alicia Asín Pérez, CEO and founder of Libelium, a Spanish company that facilitates the collection and sharing of data via the Internet of Things. Libelium provides customers with sensors that are specific to their goals and connects those sensors to the cloud. The service has been used to evaluate the health of parks and green spaces in Spain, to track racing ships during competitions in Germany and to monitor rivers in Colombia to prevent floods. The third prizewinner, taking home €30,000, was Walburga Fröhlich, an Austrian entrepreneur whose business makes it easier for people with disabilities to enter the workforce and engage in public life. Her company, atempo, translates complex government texts into formats that are easily understandable for people with learning difficulties and disabilities. ‘If you cannot understand what’s going on around you, and if you do not know your rights, then the truth is that you are not able to participate easily in society,’ she said. The prize for the best female innovator under 30, the so-called Rising Innovator award, went to Karen Dolva who co-founded a company called No Isolation. The Norway-based business works on improving communication between socially isolated people and the outside world. Their first product was a robot that enables children with severe long-term illnesses to interact with their friends and attend school while bed-bound. The robot takes the physical place of the child in the classroom and the sick child can then communicate with friends and teachers via the machine. According to the EU's 2015 She Figures report into gender equality in research and innovation, women made up 47% of PhD graduates in the EU, but accounted for only a third of researchers and one-fifth of top-level researchers. Only one in five heads of institutions were female. The EU is addressing this in a number of ways. This is the fifth year of the EU Prize for Women Innovators, which is open to women living anywhere across the EU who have founded a successful company, brought innovation to market, and who have benefited from research and innovation funding from public and private sector. It is the second year that the Rising Innovators category has been included. The EU is also working to achieve gender equality in research and innovation through its research funding programme Horizon 2020, and through the European Research Area to break down barriers to research. The aim is to achieve gender equality in scientific careers and decision making, and to integrate the gender dimensino into the content of research and innovation.